This was designed as a between course palate cleanser and worked well in that guise. 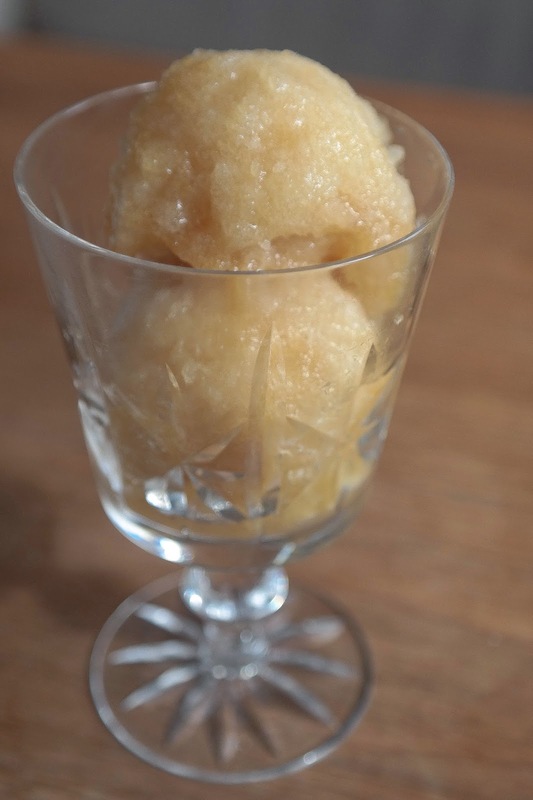 It's terribly simple as well – as, indeed, is any sorbet. A lot of people ask why would I add both sugar and lemon juice, don’t they cancel one another out? The answer is that of course they do taste-wise, but that's not what the sugar's there for. 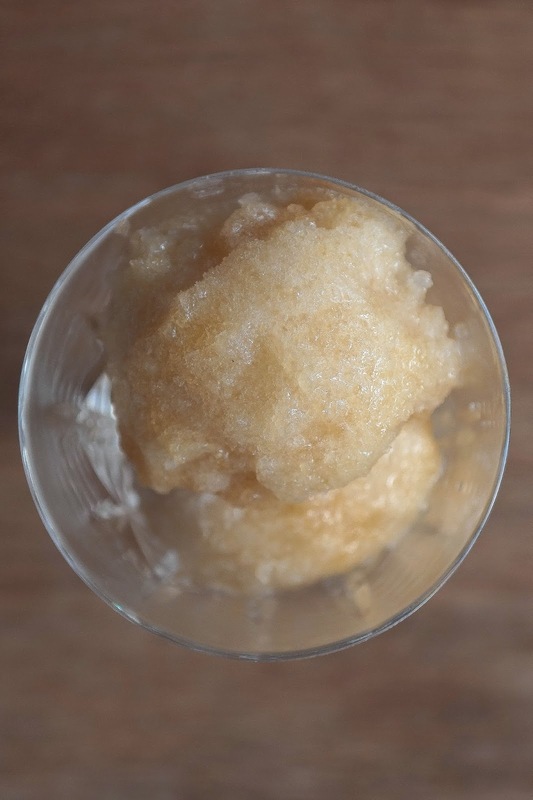 The sugar helps the appropriate ice crystals to form, without which the sorbet would be crunchy and hard, not smooth and tasty. The lemon juice counteracts the sweetness. So you need both there. 1. 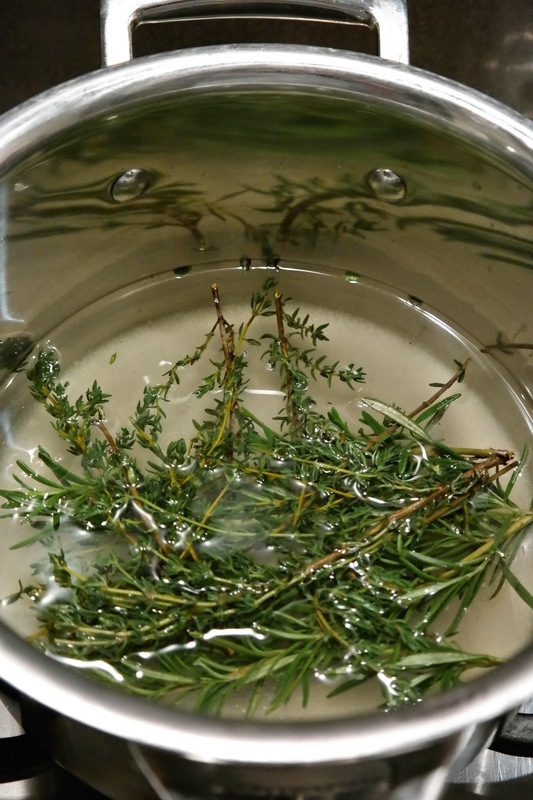 Make a rosemary and thyme syrup by gently heating the sugar and the herbs in 350ml water. Bring to the boil and simmer until reduced by half. Turn off the heat and let cool. 2. 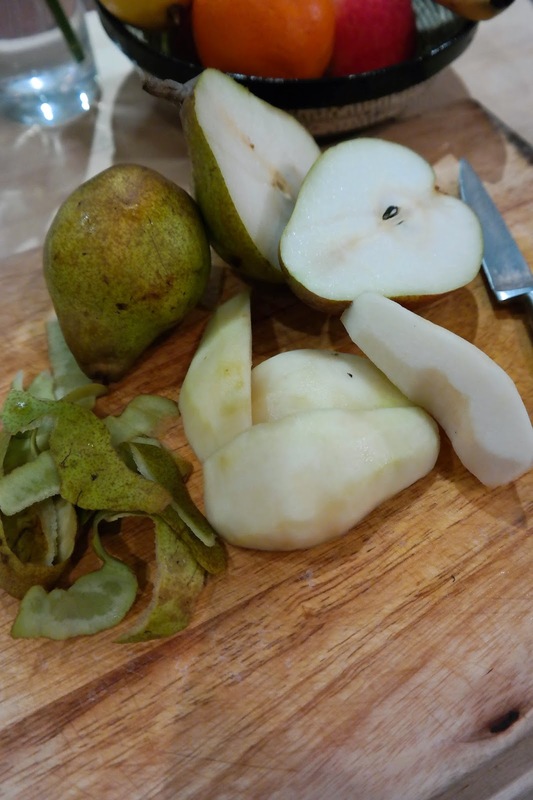 Meanwhile, peel and core the pears and stick them in the food processor. 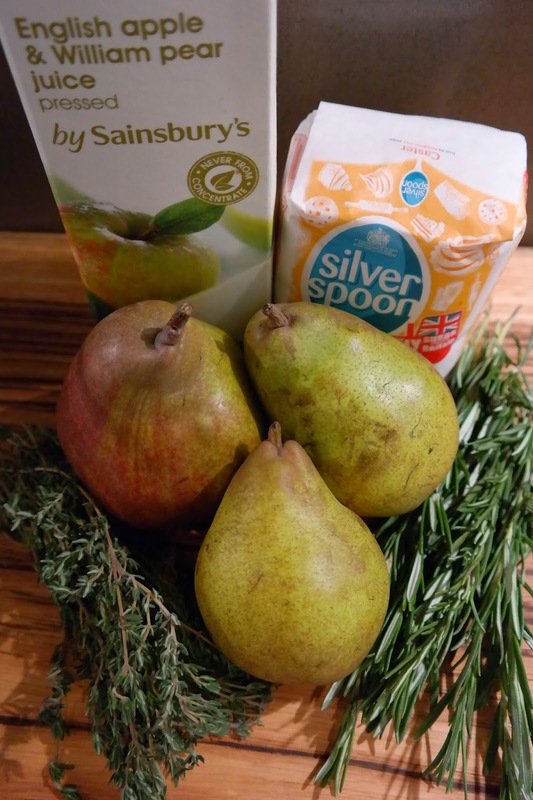 Pour this into a measuring jug and top up with juice so that you have 500ml in total. 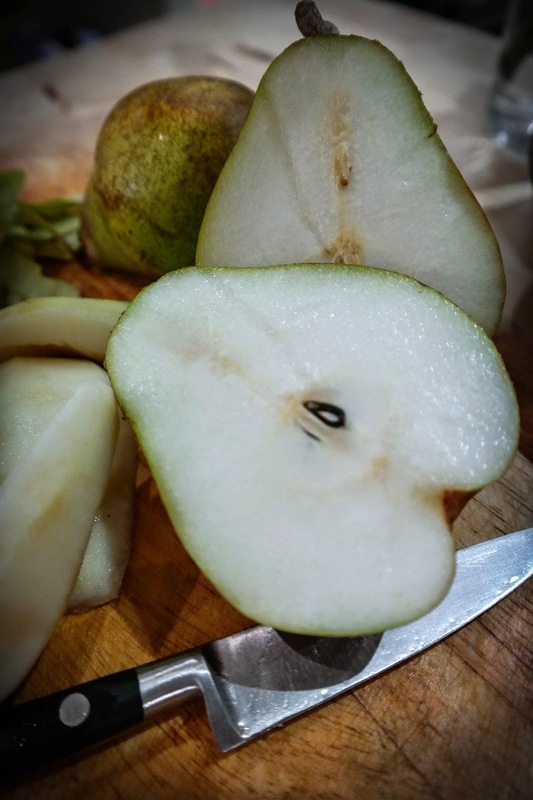 First time I made this I actually found that I didn’t need much juice at all – it varies depending on how big your pears are and how much they yield. 3. 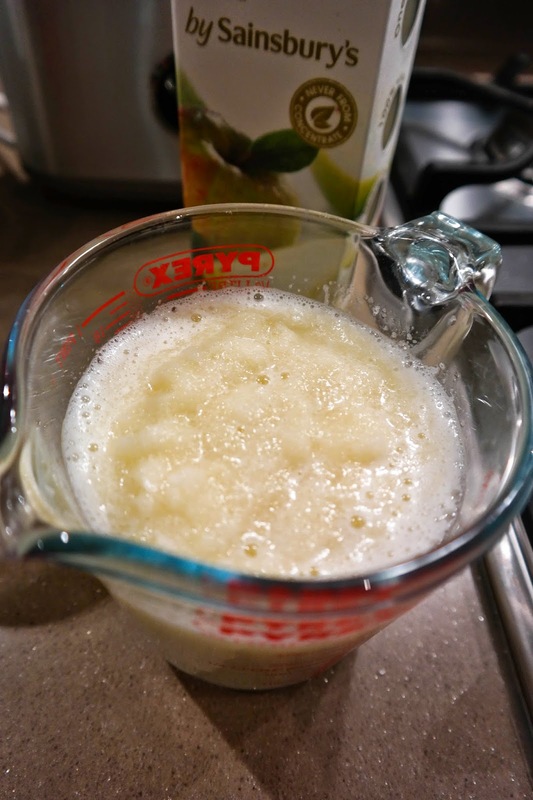 Strain the syrup into the pear mix, add the lemon juice (to taste – add more if needs be) and leave the whole lot to cool, preferably in the fridge overnight. 4. 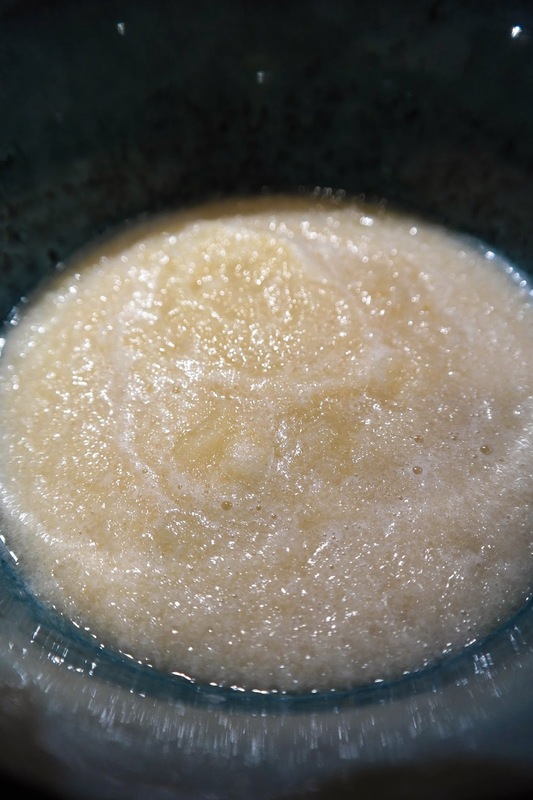 Once cooled, churn in the ice cream maker to the manufacturer's instructions. 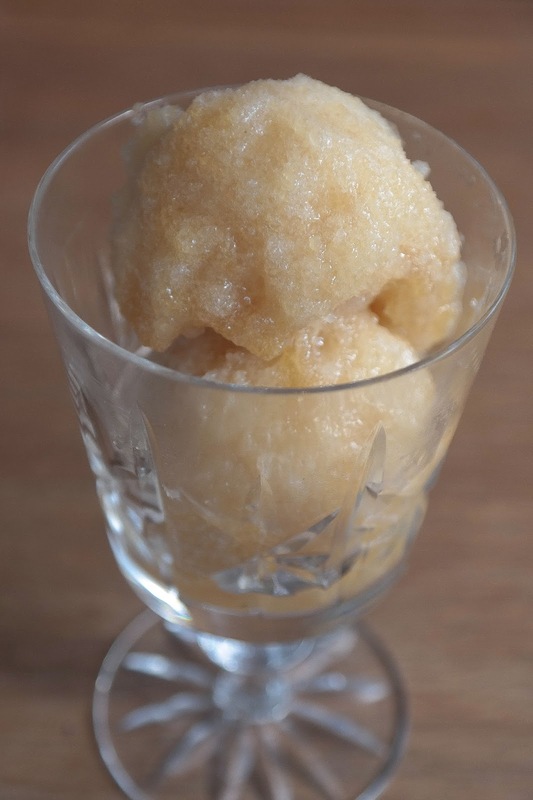 As with all homemade sorbets and ice creams, it will benefit from some time in the freezer before serving. For a while, there was not much around my neck of the woods to get too excited about (food-wise, that is). Sure, you had the Abbeville Kitchen behind the Common and Trinity on the Pavement – but there was nothing that the real food aficionado would have heard of. Don’t get me wrong, I always thought we had it good – and we do – it's just it sucked a bit that people would ask what there was nearby then stand with the blank face of incomprehension as one reeled off a list of very decent but unknown restaurants before blurting out "Brixton Village" and denying that it was, actually, quite a long way away. That's changed now. Now we have The Dairy, which everyone seems to have heard about and which everyone does rave about. Rumour has it that there's a certain French tyre manufacturer's star in the offing, although I don’t know about that. This post, however, isn’t about The Dairy but about its newborn baby sister, The Manor, that's acquired a site around the corner that was until recently occupied by a (pretty grim) Spanish place. Now, with stripped walls, bare bulbs, the obligatory faux historic set of antlers and some even more faux graffiti – as one companion put it: "trendy – almost achingly so" – it has become something altogether smarter, nicer, classier. 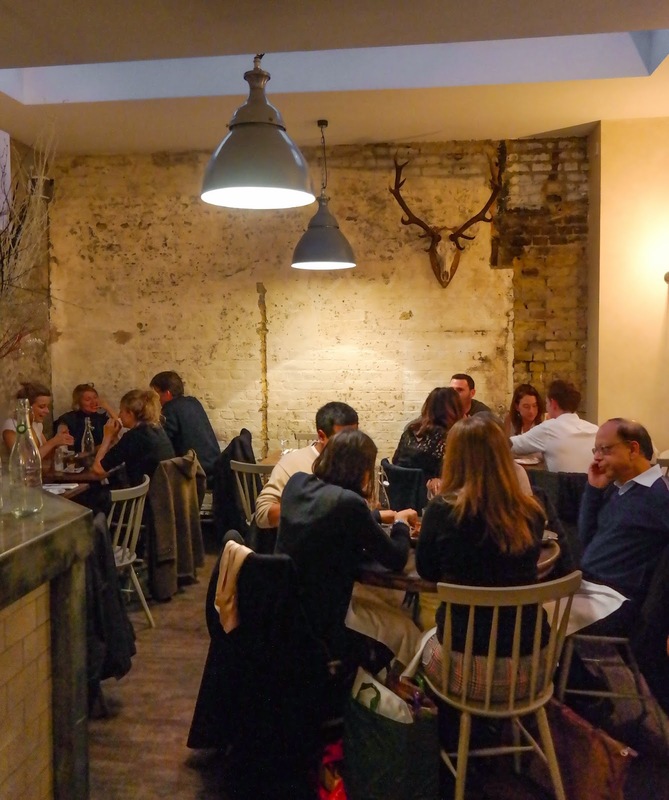 In fact, I'd go so far as to say it's a joy to eat there just for its surroundings, which despite the cold industrial chic design is somehow warm and welcoming. But if the environment is good, wait until you get your hands on the victuals. Oh my. 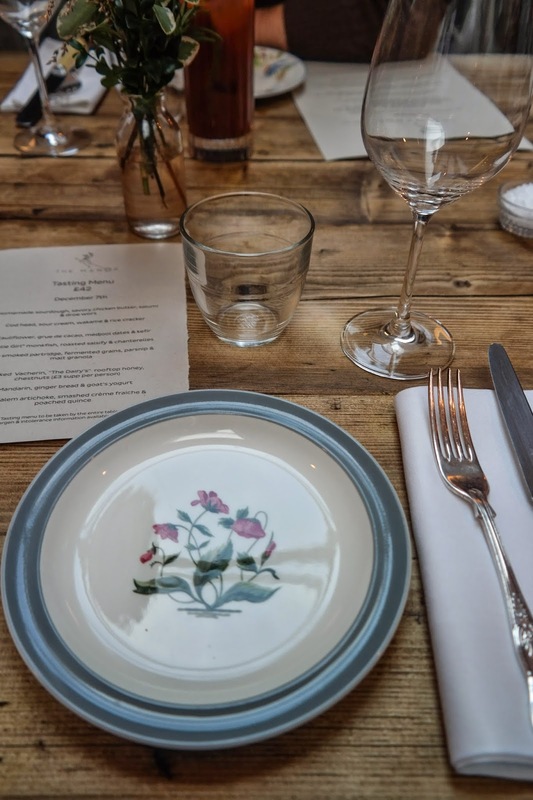 Dealing in what I would describe as 'modern British', they have nailed what it means to serve really very decent plates of honest food without, I am relieved to say, falling into the same trap as Big Brother The Dairy: small plates with big prices. 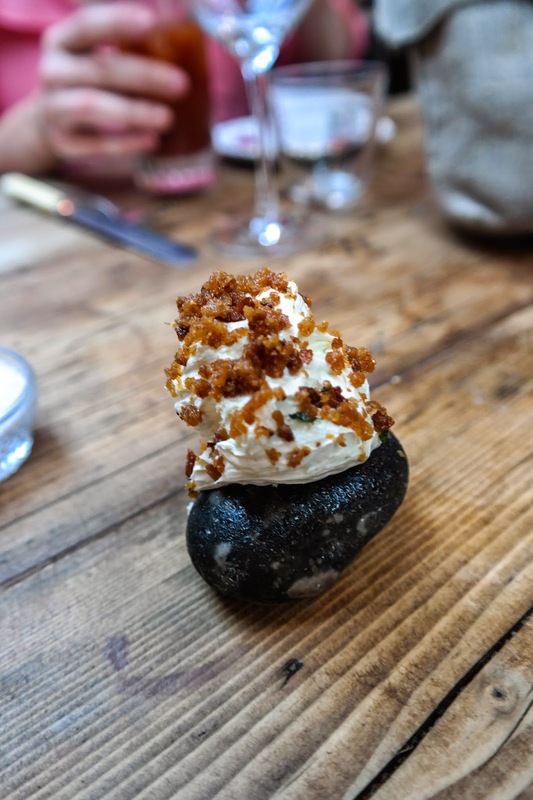 We opted for the seven course tasting menu, which at £42 a head may sound steep but really isn’t bad at all – not given both the quantity and the quality. 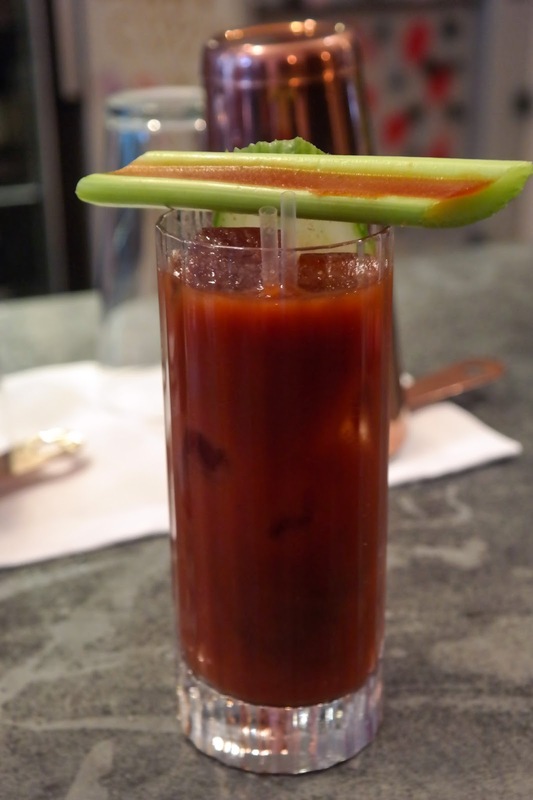 But before we got there we kicked off with a round of Bloody Marys. Like all good bartenders, the resident barkeep eschews the old ways of slopping some tommy juice into a glass, adding a dash of heat and sauce and mixing in a puny measure of voddy. Oh no, this is something altogether more refined. The vodka is smoked. 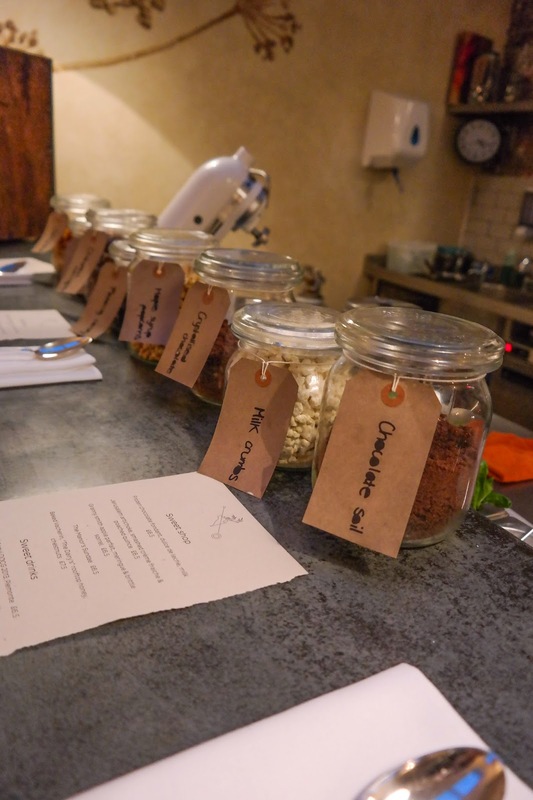 The mix is made up of all manner of things, including (in addition to spice and Worcester) port, sherry, fresh horseradish and olive brine. The garnish includes cucumber (which is also to be found in the juice mix), the scent of which matches a Bloody Mary so insanely well I'm left wondering how it wasn't dreamt up before now. 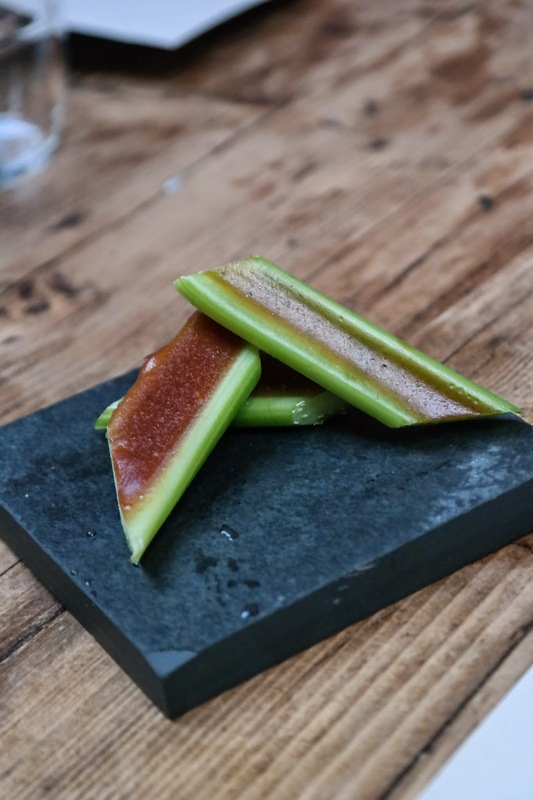 The accompaniment is a stick of celery filled with a tomato reduction jelly, a playful twist on the Bloody Mary's more usual accessory and those boats of cream cheese your granny used to serve up as pre-dinner snacks. The result was terrific – blew many a Bloody Mary out of the water. 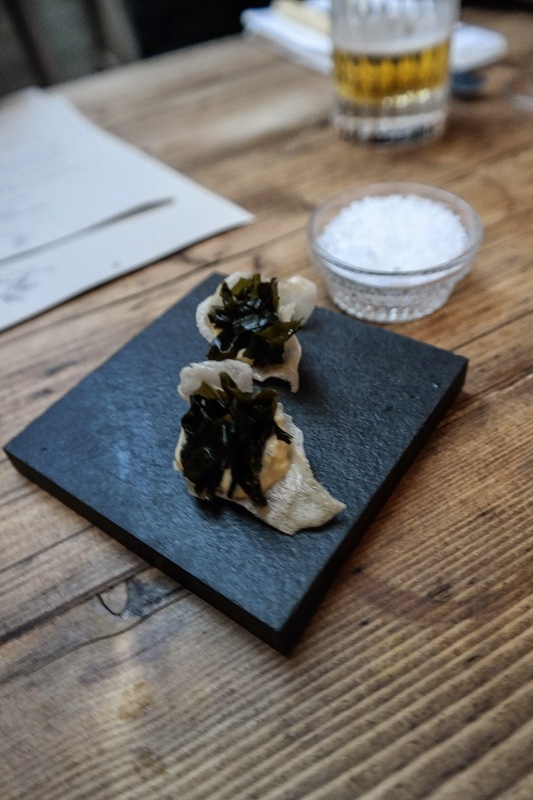 And then, as we sipped our sharpeners and passively argued about whether we should be getting the tasting menu or ordering a la carte (I won): Lo, there appeared before us snacks in the form of seaweed and wasabi delights, served on a crispy cracker. 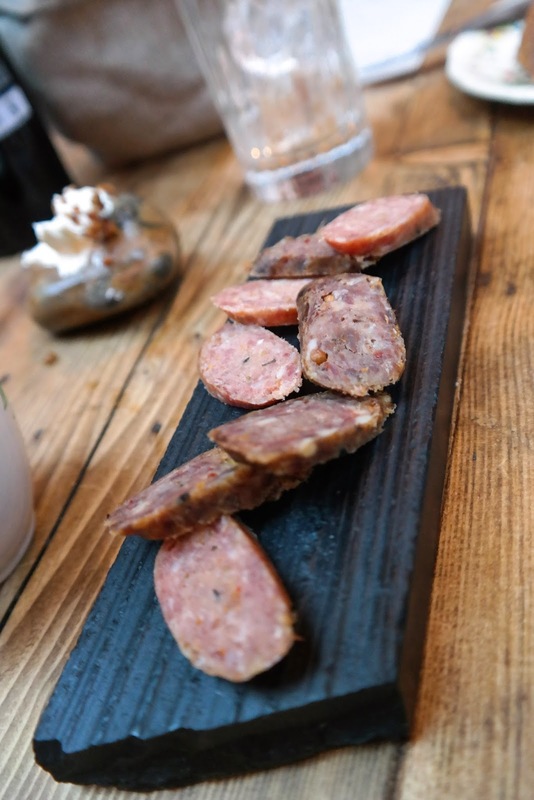 Served on slate slabs. Awesome. 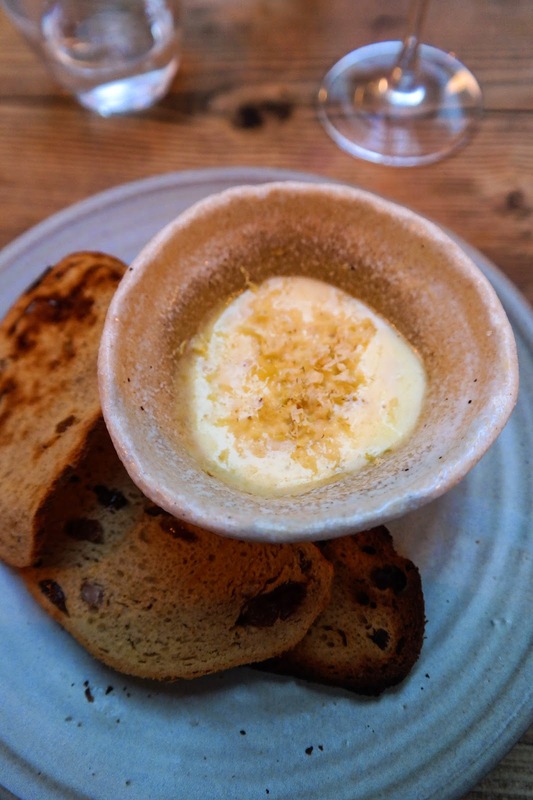 The first course of our seven course feast was, rather cheekily, bread and butter. I use the term 'cheeky' advisedly, and carefully. And I mean it. Don’t, please, call something 'seven courses' then basically make the cover a course. It's not. Just give it away free. Of course, I can’t complain too much because it was insane. Seriously. 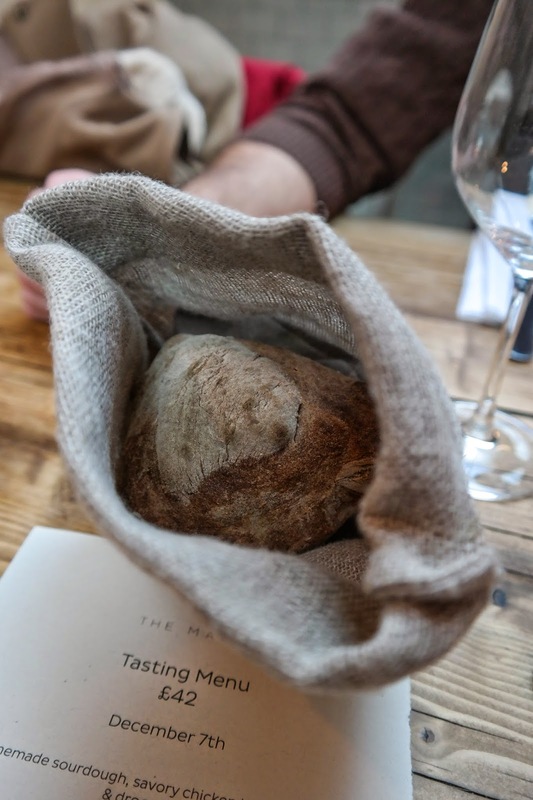 Freshly baked sourdough rolls served in their own little jute sacks (all together now, Awwwww...) served with whipped butter and crispy chicken skin. One matey said of this offering: "Can I just have six more courses of that?" Tempting. 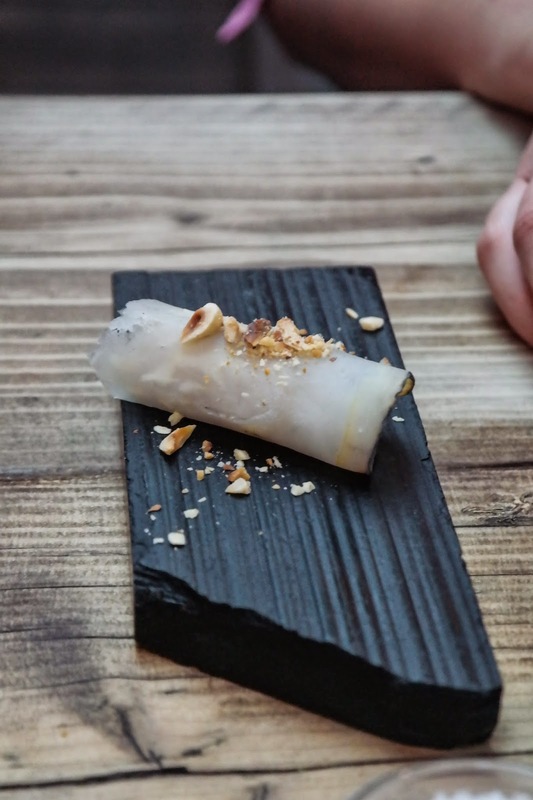 Also, rather nicely, they didn't hesitate to accommodate both dietary requirements and veggies – which is nice; all too often when you say someone doesn’t eat this or that you get a blank stare and are told you can’t have the fixed / tasting menu. Not here. To keep her bread happy, the one vegetarian of our gang was delivered a separate serving of clotted cream and buttermilk butter, whipped up by the on-site pastry chef. 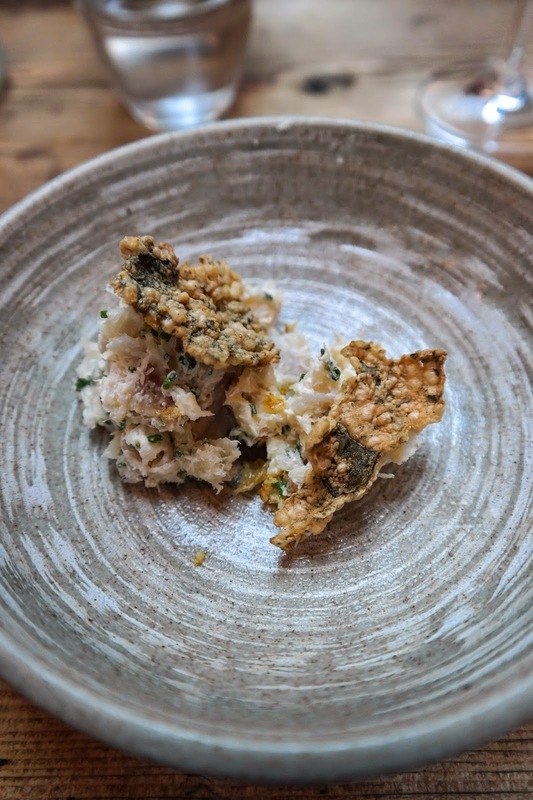 And whilst we were presented with a little slab of mixed South African sausages, our resident salad muncher got a rather beautiful looking snack of crab meat, wrapped in celeriac and sprinkled with hazelnuts. But at last, the first (proper) course arrived: The hilariously named cod face. Served with a creamy sauce and seaweedy rice crackers, this was a nice dish but just shy of the mark, I – and my fellow diners – felt. Although none of us could quite put a finger on why – one saying it needed chilli, another saying it needed more cream, yet another querying if there was enough cracker to provide crunch - and I felt it just needed a squeeze of lemon. Still, nice enough, if only that. Next up: cauliflower, grue de cacao, medjool dates and yoghurt. Not a combination you'd naturally go for, but holy cow it was good. Like, really, really good. 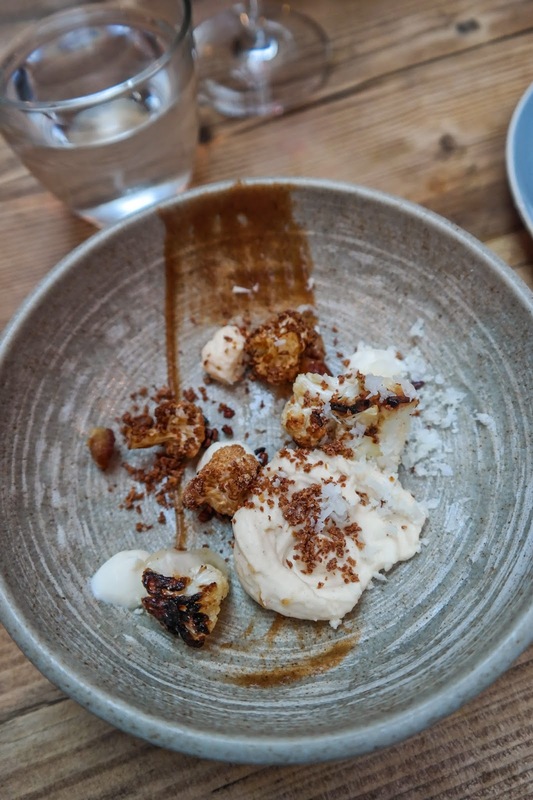 My childhood memories of cauliflower are of overcooked mush in school dinners, or sticky slop masquerading as cheesy comfort food, so I seldom get too excited about it on a menu. Until now that is, because this was wonderful. 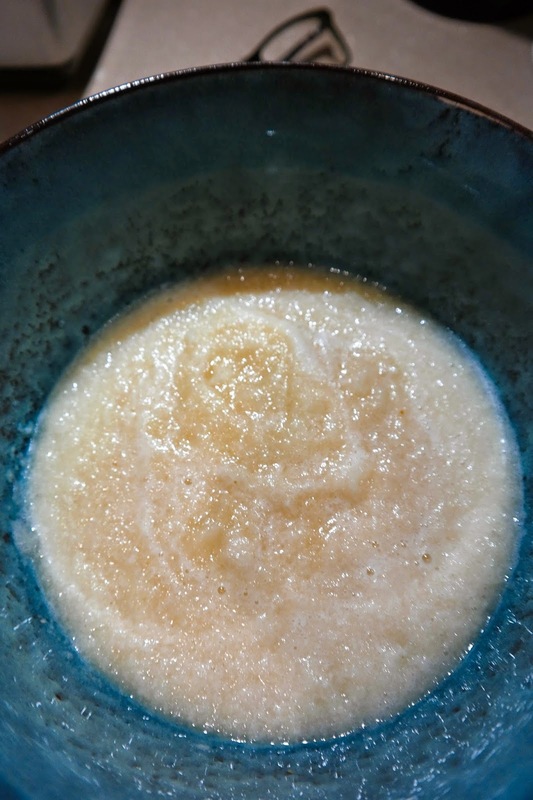 It tasted of cauliflower – not always a good thing, I grant you, but in this context spectacular. The accompaniment of the sweet date, sharp yoghurt and bitter cocao nibs were perfect. The next fish course took the form of monkfish, served with ceps and salsify cooked three ways: puréed, roasted and pickled. This was a polar opposite to the cod face – exciting, zingy, wonderful. 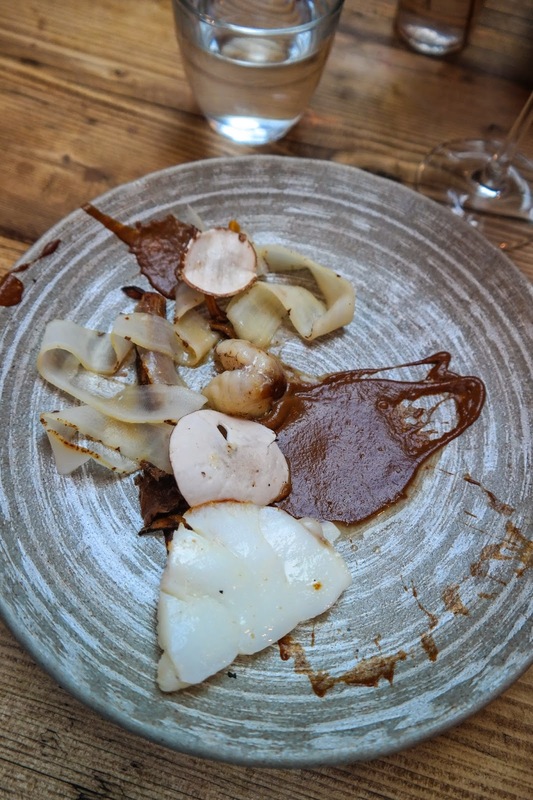 My only complaint was the smear of salsify purée – totally unnecessary and very unappealing. As my neighbour said: "tempted to send it back, saying I've got a dirty plate". But that aside this was fantastic – quite a few declared it their dish of the day. 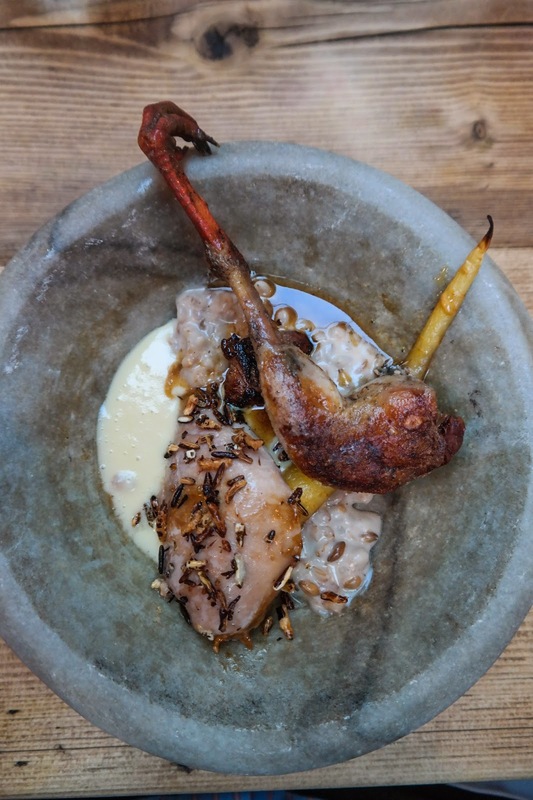 Curiously, the only meat took the form of a game bird – specifically a hay smoked partridge breast and the beasts leg, confited, served up with fermented grains, puffed rice and parsnips. This was (by a whisker) my dish of the day. 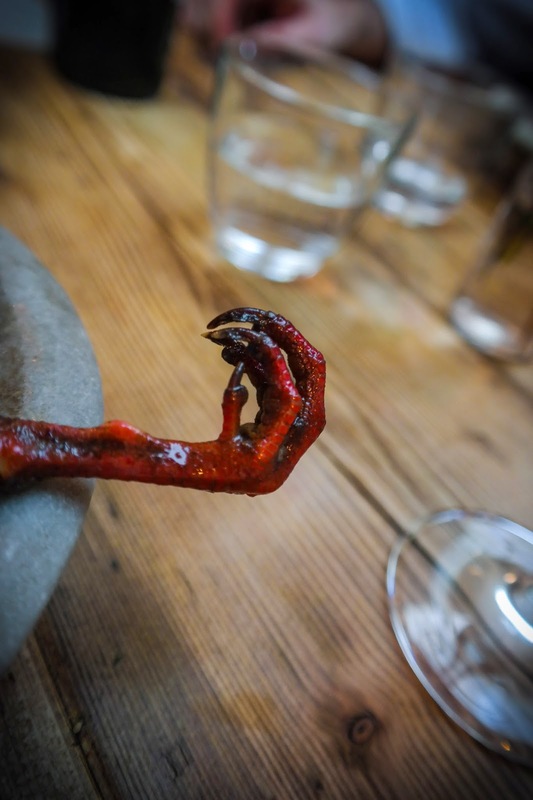 The two textures of bird – soft, smokey, delicate breast and more meaty, crunchier leg – was delicious. The grains were also excellent, with a hint of sharpness that took the edge off the game. And then there was the parsnip as well – let's make no bones about this, parsnip and game birds are just perfect partners. Perhaps unadvisedly we chose to have the optional extra cheese course next – baked vacherin (my favourite cheese), honey from The Dairy's rooftop hives, shaved chestnuts and raisin bread. I say 'unadvisedly' only because we'd already eaten a tonne of food, not because it was bad. It wasn't; on the contrary, it was another triumph. 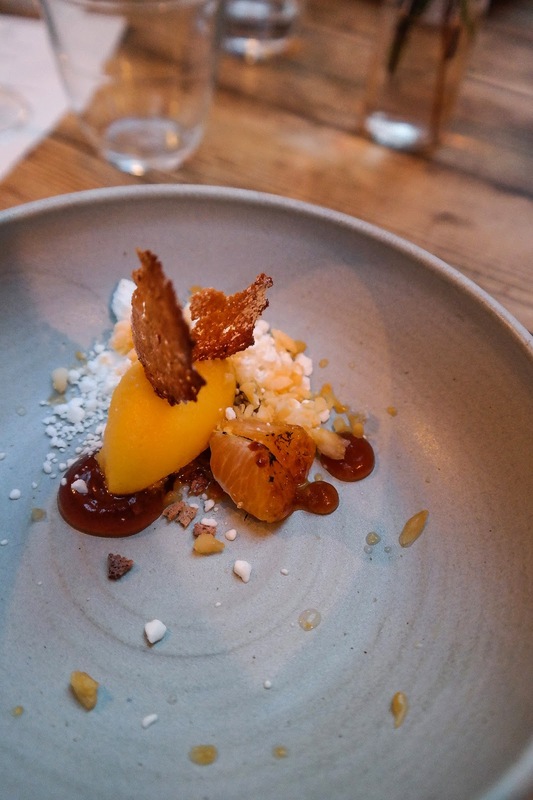 The first of the puddings followed: mandarin sorbet, mandarin segments, mandarin marmalade, kept company by goat's cheese snow. 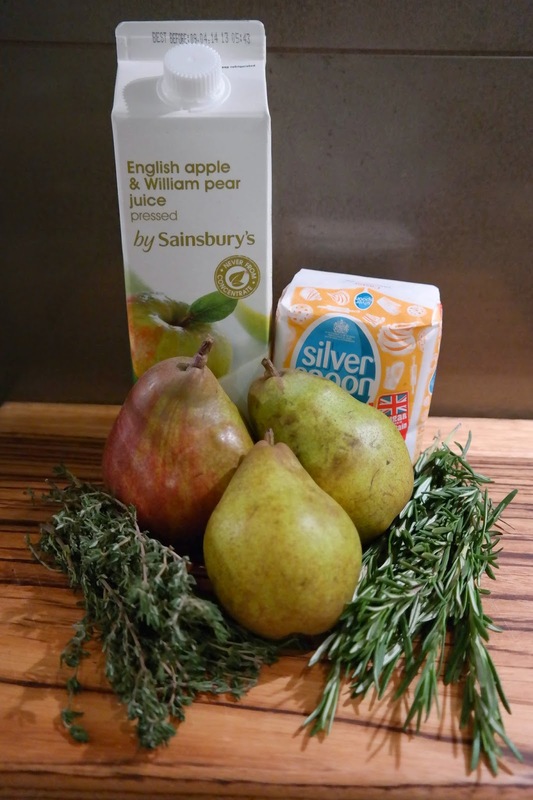 This was a triumph – the dish that the partridge so narrowly beat for dish of the day. It was wonderfully refreshing, with the creamy snow muting the zing just a touch (in a good way) and the marmalade adding a hint of bitterness somewhere at the back. A fellow diner said of this dish: "I could eat a dozen more bowls of just that." I don’t disagree. And finally: course seven, pudding two. 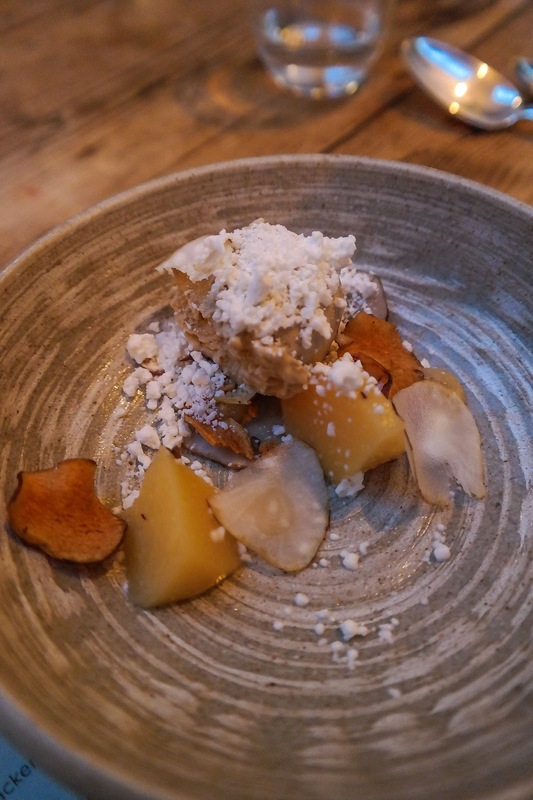 Jerusalem artichoke ice cream with thinly sliced Jerusalem artichoke shavings, 'smashed' crème fraiche (frozen and snowed, in reality) and poached quince. WTAF? (I hear you cry.) Jerusalem artichoke ice cream? Yes, actually. And yes, before you ask, it's really, really good. It's almost like caramel, in a sense, without being so sweet. The shaved artichoke as well was a triumph, adding a much needed crunch to the dish. The crème fraiche was... well, not much really – I could have lived without it, but it didn’t detract from the dish at all. 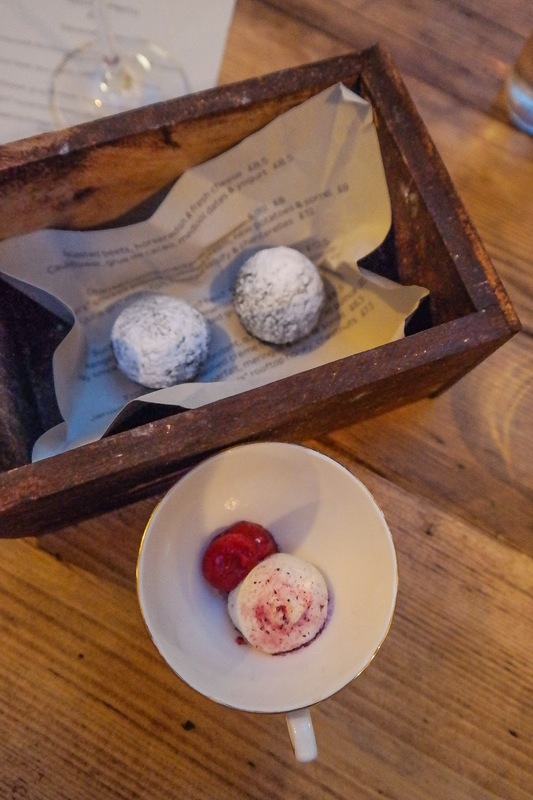 Tasting menus are all well and good, but the a la carte menu also looks pretty damn tasty. And, if you go that way, to finish it off you can climb up to the sundae bar and be treated to fresh ice cream mixed with all manner of treats. Finally, of course, with coffee came some dinky little seed cakes, whipped cream and jam. Served in a draw pulled out of a vintage apothecary chest. Lovely. In all, The Manor has nailed it, I believe. This place has been transformed from a down-at-heel local institution to a first rate, smart restaurant serving up some of the finest eats around. Happy days indeed. PS: There is, sadly, one exception to the brilliance of this place - the lavatories. I don't usually write about that sort of thing, but they are, I'm sorry, hideous – they apparently blew the budget on the rest of the restaurant and ran out of money – something I can believe given that there are still posters for the predecessor restaurant in there. Other than that, this place rules. On Tuesday I mixed a pomegranate cocktail as a sort of pre-dinner drink. 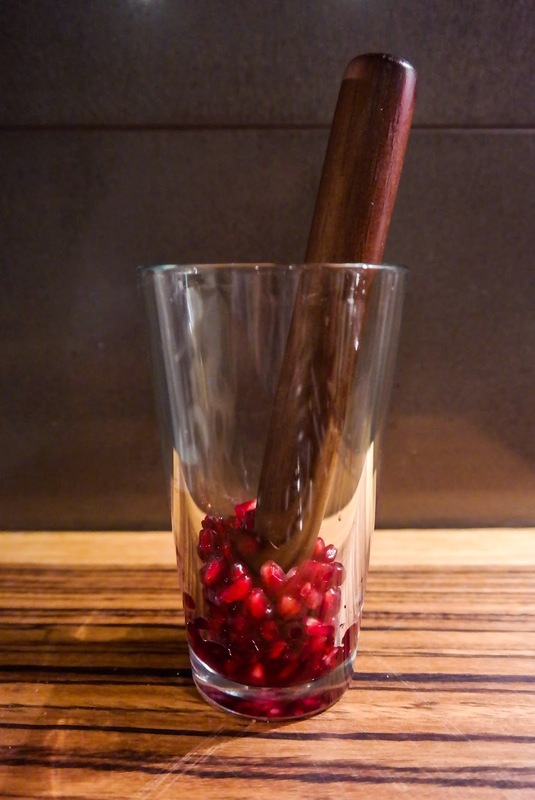 As the pomegranate I was given was bloody enormous I had plenty left for another fantastic drink. I personally much preferred this one, but I'm sure it's completely a matter of taste. 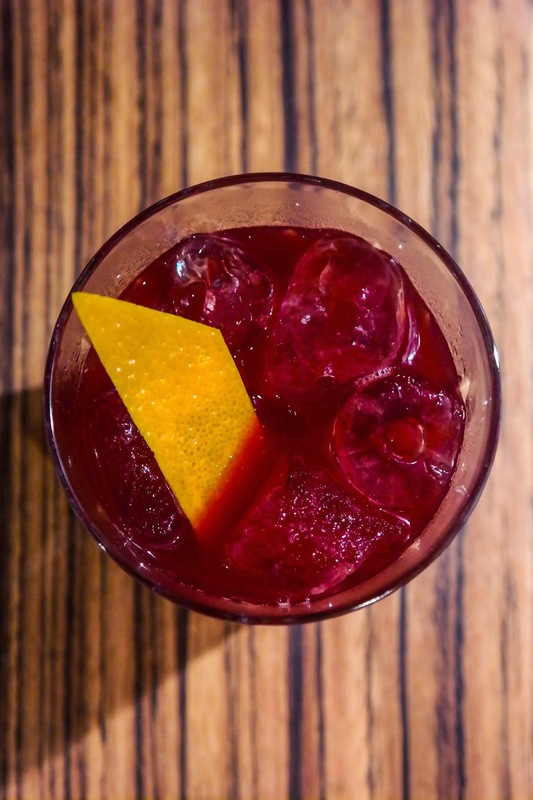 It does, I think, include all of the required elements of a perfectly balanced cocktail: Sweet, sour, bitter and fruit. 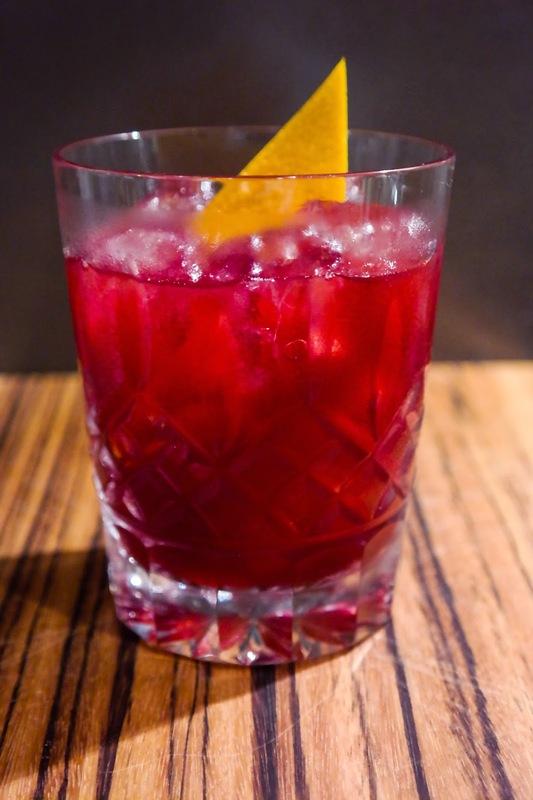 It's also more complex than the pomegranate cocktail, but I recok it's worth it – and not nearly as tough as it looks. As an old fashioned style cocktail it's strong. One is enough. 1. 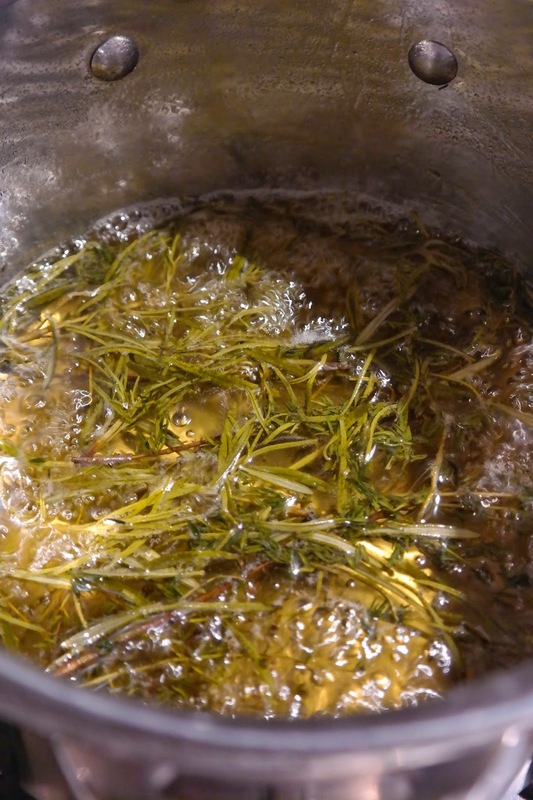 First, you gotta make a spiced syrup. This is probably the complex part, and it's not complex. Crack the cloves and cardamom pods in a pestle and mortar then chuck them in the smallest saucepan you have. 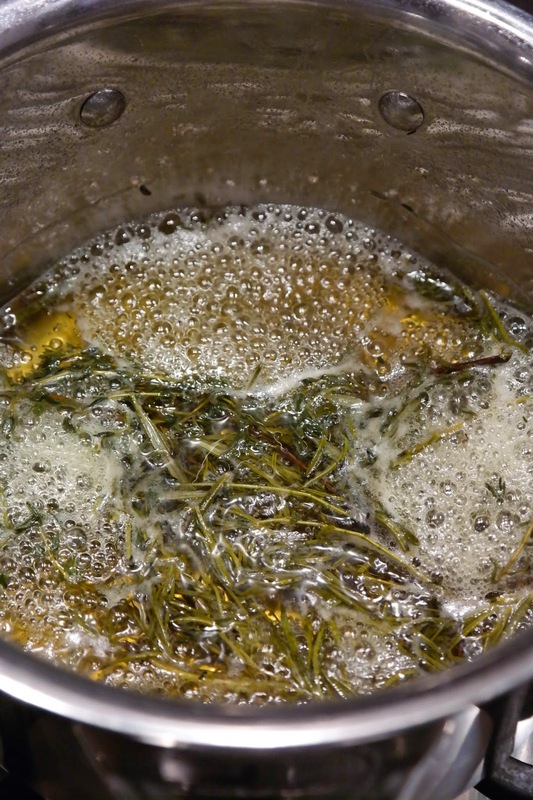 Add the water and sugar and heat until the sugar is completely dissolved (this won’t take long). Turn the heat off and let the mix cool right down before straining and bottling. This will make way too much syrup, by the way, but it'll keep for at least a month in the fridge and I can’t really see a way of making it in smaller quantities. 2. When your syrup is bottled and ready to go, you can get on with mixing the drink. 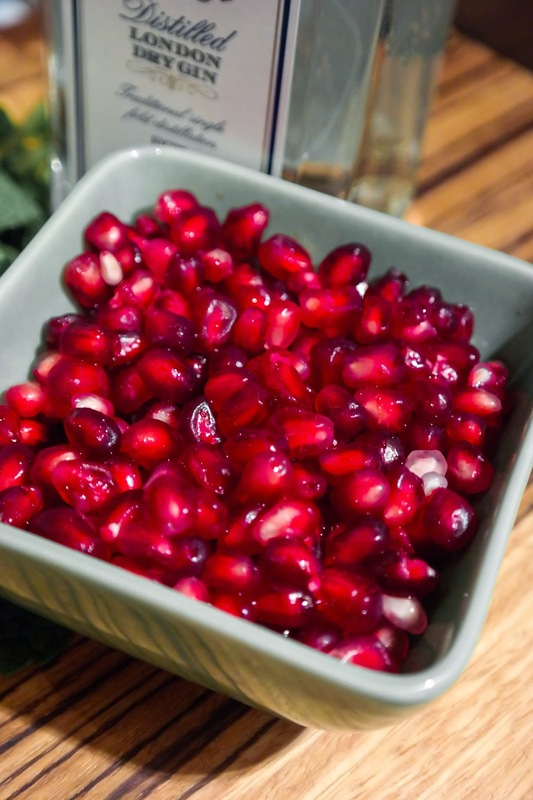 Start by placing the pomegranate seeds in a cocktail shaker or boston glass. With a muddler / end of a rolling pin, crush the seeds gently – push too hard and you'll end up cracking the seeds themselves, which are bitter and unpleasant. 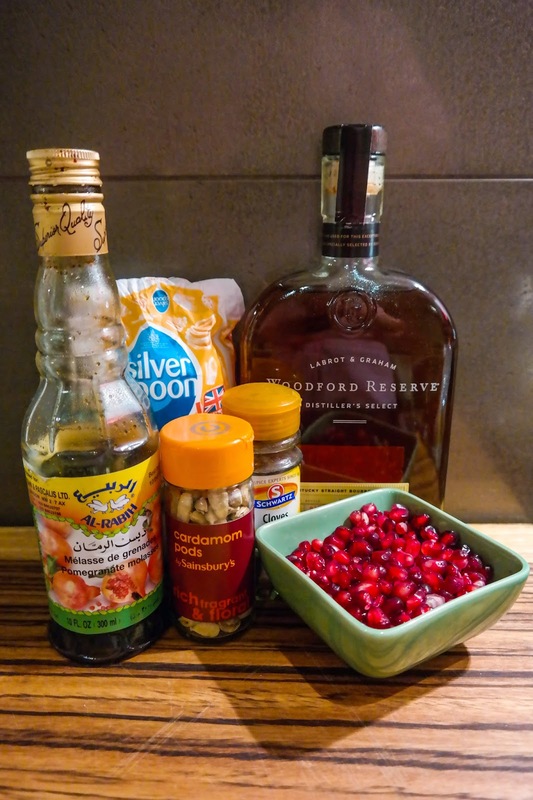 Add the bourbon to the mix and stir. 3. 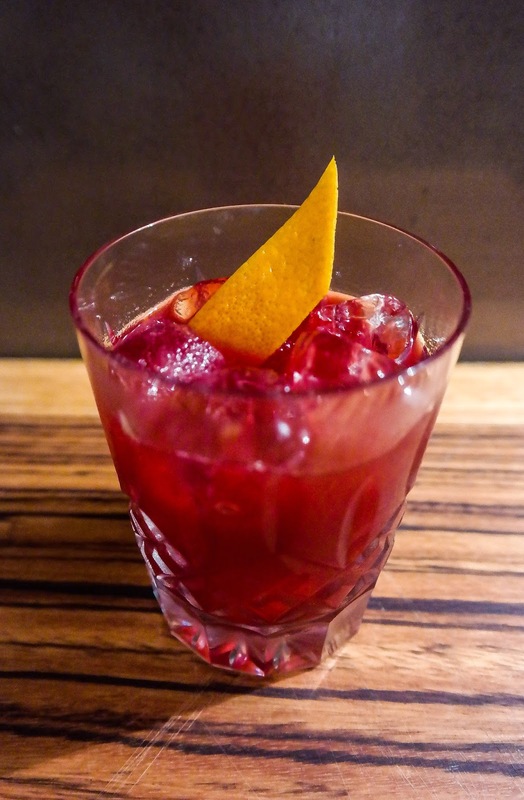 In an old fashioned glass mix the pomegranate molasses (despite the name, this is really sour – a proper kick of sharpness) and 50ml of the spiced syrup. Stir together. 4. Strain the pomegranate juice and bourbon mix. Add about half of it to the molasses and syrup mix and stir so that they're fully combined. Add a handful of ice and stir again until properly cold. Add more ice and the remainder of the juice / bourbon and repeat. It has to be utterly chilled to be right. 5. Cut a thick slice of orange peel off the fruit using a vegetable peeler – I find that this takes away as little pith as you can get, which is (again) horribly bitter and should be excluded to the extent possible. 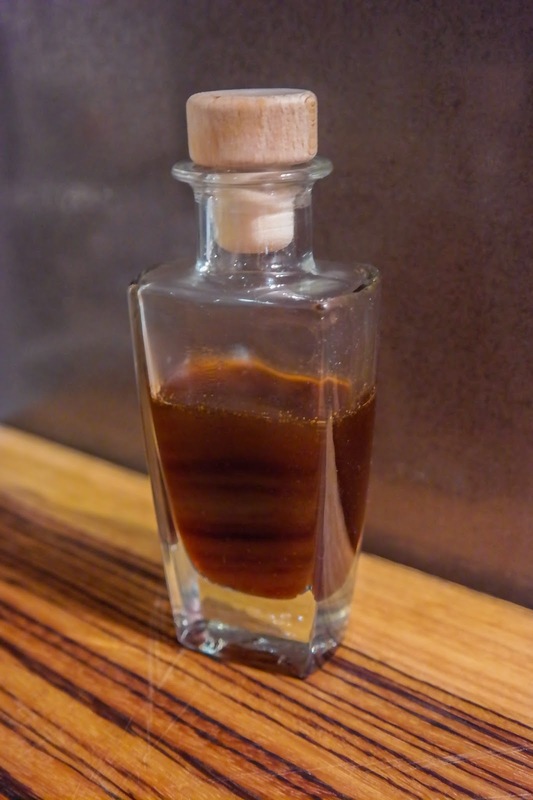 Twist the peel over the glass to release the oils, before adding to the drink and giving it one final stir. For my birthday I got given a pomegranate. OK, this sounds a bit odd. I recognise that. I got given other stuff as well, just so we're clear. 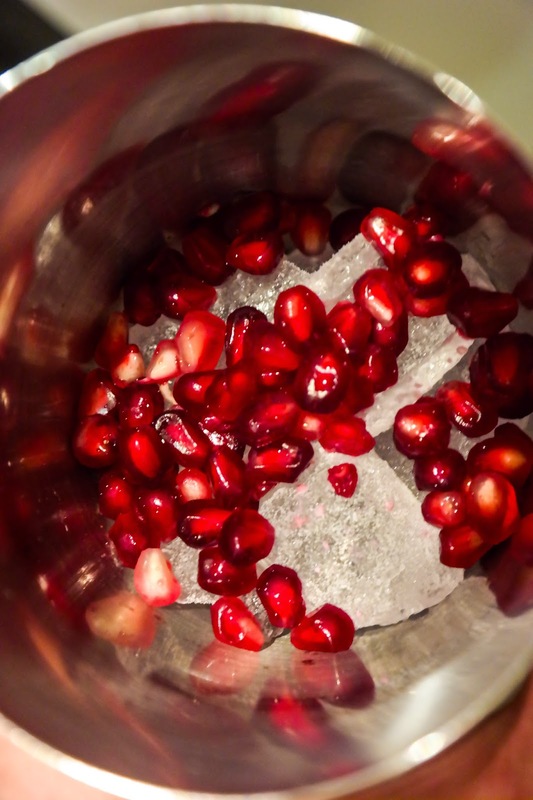 But it was a majestic pomegranate. See? Beautiful. 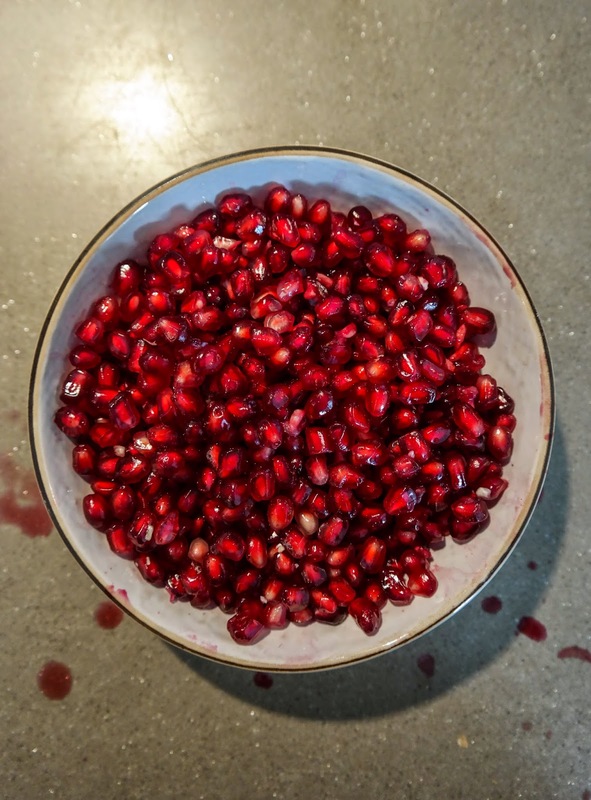 Who wouldn't want that pomegranate? After having eaten about a third of it with a spoon (it was enormous) I was keen to do something other than munch on the seeds. So I decided to make cocktails. This post, and Thursday's, charts those two drinks. 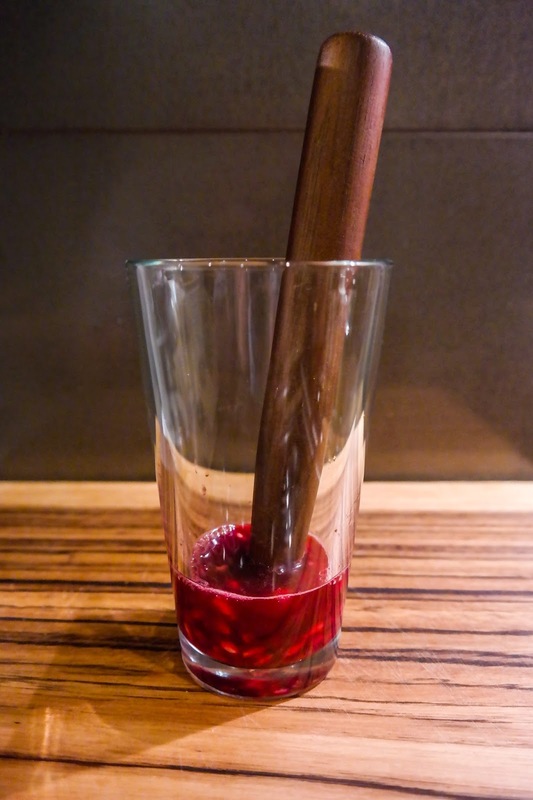 First up is A Pomegranate Cocktail. Most people I suspect would call this a pomegranate martini. I, on the other hand, am trying to lead a charge against the grim practice of naming any martini-less drink in a cocktail coupe a 'martini', so I've gone with something even more boring. This drink is dry as a bone but very refreshing nevertheless. If you wanted it less dry you could sub the gin for vodka, but you'd lose some of flavour. It's a good pre-prandial. You'll also need a cocktail shaker and plenty of ice. 1. 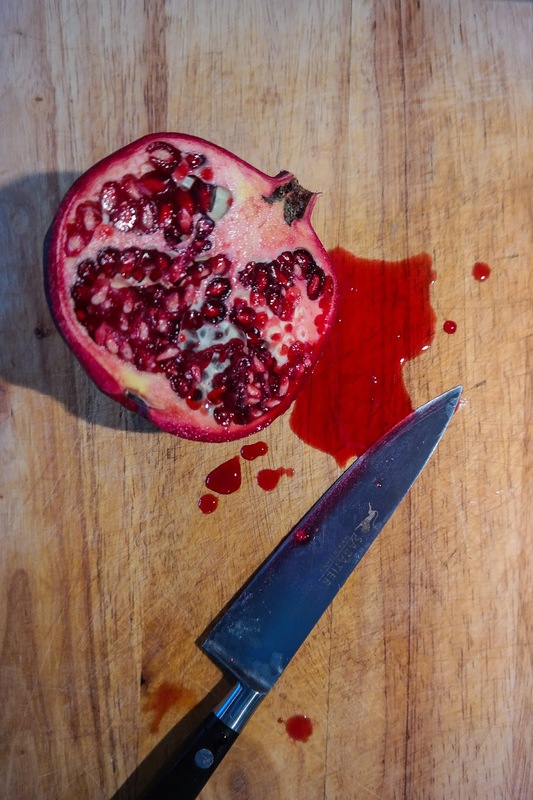 First, let's have a quick chat about peeling a pomegranate. Basically, you want to exclude all of the whitey-yellow stuff, including the thin membrane that runs between most of the seeds. This is time consuming and messy, as you'll end up inevitable spraying juice everywhere, but it's totally worth it because the nod-seeds bits are incredibly bitter. So do it carefully. 2. Scoop one tablespoon of seeds into the cocktail shaker and fill about a third full with ice. Add another spoon of seeds and more ice. Close the shaker and shake vigourously. This bursts all the little seeds. I do it this way because the seeds are also quite bitter and dry, so to avoid them overawing the drink you want to burst the little red pockets of juice without crushing the seeds. 3. Open up the shaker and add the mint, gin and the bitters. Note that this is strong – effectively a triple measure – and you should really stick to just one. 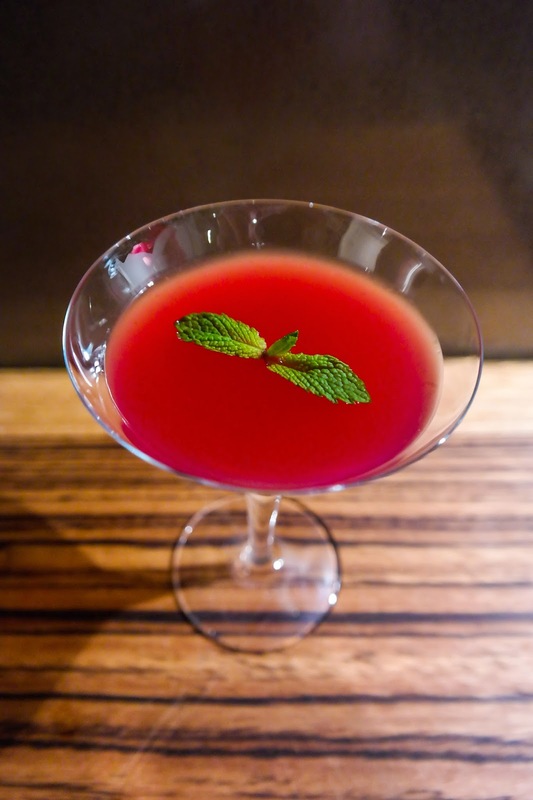 It's a martini-style drink, though, so always likely to be punchy. Close the shaker again and shake until ice cold. Strain into a cocktail glass. 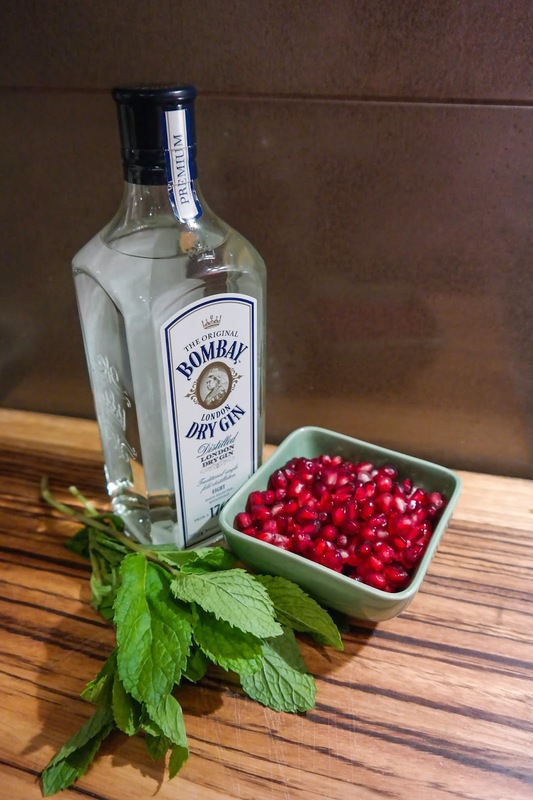 Garnish with a mint leaf and drink right away, whilst chilled.